Last week I wrote about T’s grandfather’s funeral. In this post, I’ll be writing about the man himself. I spent a week around Kunio Kasai two summers ago. The rice fields of Yamato, the little village where he lived with his wife, Hisaye, were lushly green, rippling lazily in the humidity. We didn’t talk much. My Japanese was limited to the basics. So beyond, “Good morning”, and “Thank you”, our communication was limited to laughter, smiles and offering and accepting food. It’s amazing how much can be communicated without words. In fact, interaction can be perhaps a little more profound, because of the simple, pared down beauty of non-verbality. 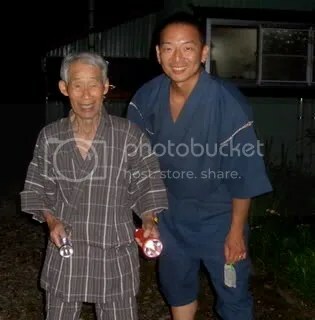 My memories of Kunio include him watching us light fireworks. And another time he whizzed by on his moped and handed me his straw hat because the afternoon sun of the countryside was so strong. He was 91 years old. 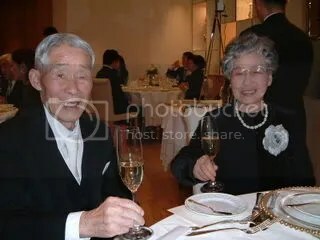 Kunio would have been 93 in February. That’s a long life. But he didn’t come close to the longevity of his mother who died at 103. There are stories that are told about him by the family and I’ve gathered some of them here. They are written in the form of an imagined interview, because that’s how the story is coming out of my pen. Wind: 92 is a long time to live. Kunio: Yes, but my mother lived until 103. W: Wow, that’s amazing. Did you know your mother well? K: Actually, she had to give me away when I was a baby. She was just a girl, and unmarried. So she couldn’t take care of me. But she lived in the next village so we were able to keep in touch almost all of my life. W: That must have been tough. What happened to your father? K: I never talked to him. He was a rich man with a lot of land. And my mother worked for him. He had his own family. W: Did your mother marry? K: Eventually she had her own family. And I became close to her children when I became an adult. W: Your youngest half-sister came to the funeral She’s quite a stylish city girl. K: Yes, we got along well. She had three older brothers, but I kind of looked out for her since I was her oldest brother. W: Do you consider your adopted family as your family? I mean the family you grew up with? K: I was more of their servant, even from a young age. That was the agreement. They’d feed me and house me and I worked for them. So no, I wasn’t close to them. W: It sounds like a hard life. K: Life was hard for everyone then. Not just me. It’s just how it was. W: You lived through a very tumultuous time in Japanese history. Practically all young men were conscripted into one of the many wars Japan was involved in at the time. K: Well I was only involved in one, the big one. But I was lucky. I was a cook in the army so I never had to fight. The only battle I fought was with the rotting food. W: How did you meet Hisaye? K: At the time there was heavy bombing of the cities by the Americans, so many people came to the countryside to live. And there was a pretty girl from Yokohama who came to our village. I was already 30 and needed a wife so the village matchmaker introduced us. We only met once before we got married. W: Do you remember that first meeting? K : At the time, I had a bad stuttering problem so the matchmaker told me to speak as little as possible. Just say yes or no. But I don’t think I said anything. The matchmaker did most of the talking. Hisaye seemed kind. I think she didn’t mind how I looked but I knew she was disappointed when we spoke during the wedding. K: [Laughing.] Well it was not a time of romance back then. We were more concerned with survival. W: You had many mouths to feed too. K : Yes, four daughters. Fortunately we were farmers. So we always had enough rice. W: Were you disappointed that you didn’t have a son? K: No, never. I wouldn’t have minded a son. But we were fortunate even to have so many healthy children. Some people were not so blessed. K: Yes. She couldn’t have children, so we sent our second daughter, Kyoko, to be raised by her and her husband. W: Do you regret that? K: It sounds strange now, but that was common then. Family is family. It doesn’t matter who raises who. She’s still my daughter. She’s just registered with another family. In hindsight, it was the right decision. Kyoko had more opportunities in the big city. She would’ve been unhappy in a small village because her personality is so big. Of course, she visited often, and she was the big star of our community when she came. W: Do you have a favorite daughter? K: That’s a bad question to ask a parent. Sachiko, my eldest, was kind of like another mother to the others. She is so smart and responsible. Kyoko of course is our celebrity. Our third daughter is known for her sweet gentleness. And Kiyoko, our baby, is our dreamer, our artist. It’s a good mix. W: If you could choose another life, what would you have been? K : Well, I enjoyed being a farmer. I was also the security guard for the junior high school down the road. I enjoyed that too, seeing so many young people grow up. But if there’s something I could do all the time it would be dancing. K: Oh yes, I wasn’t too bad. I was always asked to perform at the festivals. It’s not something you could make a living at. But really, I had a good life and I wouldn’t change any of it. I’m just glad I was able to see the snow fall on the fields one last time. Wow! I just want to say that this interview reminds me of “Secondhand Lions” about two aged men who lived an incredible life. At the end of the movie a man says to their adult grandson that they seemed to have lived quite a life. He says with a big smile “Yeah, they really lived”. I think your wife’s grandfather was like that. He REALLY lived. yeah, he really did. i was told that on the last few days at the hospital, he was up and about, smiling and joking. t’s dad described this as a last burst of light before the candle goes out.